i used to rush the mornings. if we had to be somewhere in the morning, i used to run around like a madwoman getting ready, yelling commands at the kids to hurry up. i'd shhh their chatter to try to keep them focused on putting on their socks and shoes. i'd stop their little impromptu game of tickle-tag and hustle them into their carseats so we could hurry off to wherever we needed to be. but sometime about two years ago, after i'd rushed through breakfast and worked myself (and my children) into a hurried frenzy, i caught the sunrise. and isn't it beautiful? it's beautiful every time. and another thing about the sunrise? it's slow. but if you don't catch it, you'll miss it. the sun isn't in a hurry to rise, and it creates incredible beauty for her surroundings the way up. that morning when i caught the sunrise after hurrying, i promised not to hurry another morning. i promised i'd stop my rush and instead create incredible beauty for my surroundings in my own little way. this is how God, the maker of the sun!, starts my day, and i certainly don't want to miss it. these slow moments of watching Him light up another day...i just bask in His glory and love. what a beautiful way to begin life again each and every day! last week, the kids and i had a pleasant morning and didn't rush to get where we were going. when we got there, the sun was still rising right in front of us. before we went inside, we stood in the parking lot and admired the unrushed sunshine. the sky was streaked with blues, purples, and pinks, some oranges and yellows, and some blended colors that we couldn't even name. and "isn't God amazing?" and "aren't we so thankful for yet another day of this life?" in this slow rising beauty and in His ever-living Word. i watch the sun rise, i remember these promises, and i let it set the tone for the rest of my day. see the pretty "Today" printable? 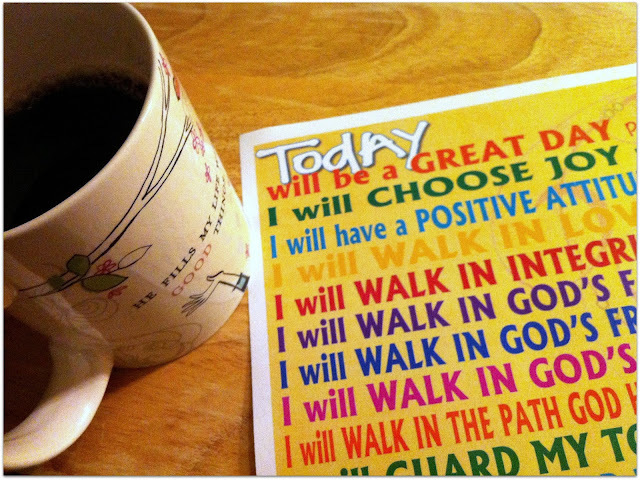 it's a declaration that "today will be a great day," with accompanying bible verses that promise the same. my Pastor's wife, Mrs. April Osteen Simons, came up with this declaration and i loved it when i heard her say it about two years ago. i read it in the mornings with my children, and like the sunrise, it reminds us of God's promise and sets the tone for our day. i want to encourage you to start your day slower. call your day great as it's getting started! claim God's promises for joy and favor first thing in the morning. His word is good! i'd like for you to have the "Today" printable, too! i am sharing the free download on my Facebook page today. go like my page, print the declaration, and have a beautiful day.